It goes without saying that this season is a month of ceremonies and cultural functions. The prestigious educational institution, Ispahani Public School and College, Chittagong organised a prize giving ceremony along with a cultural function. 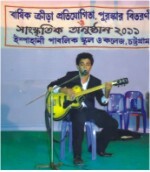 The annual prize giving ceremony of Ispahani Public School and College, Chittagong was held on February 4, 2011 at the college premises. Ali Ispahani graced the occasion as chief guest and Sajid Ispahani and NUM Humayun were present as special guests. 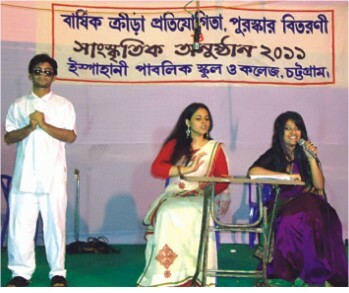 Mahbubul Alam, Principal of Ispahani Public School and College (IPSC), Chittagong presided over the function. The chief guest inaugurated the programme by releasing balloons. Later on the chief guest delivered a speech. In his speech he stressed the need for physical activities and sports in student life. He also advised the students to play regularly along with studies. He further added that games and sports help one to lead a disciplined life and prepare for future leadership. Followed by the chief guest's speech a display was demonstrated by the school girls. They presented different historic monuments of Bangladesh. Then, the anchor announced the names of winners from different events and the chief guest gave away the prizes to the winners. The Principal concluded the function with a vote of thanks to all. IPSC is not only distinct for its academic excellence but also unique for its eventful cultural programmes. However, the most awaited cultural function started in the evening. At that time the anchors were the students of first year. Songs, dance routines as well as short plays were performed by the students from school section. The students exhibited a magazine programme titled “Itiadi”. Indeed, Itiadi was a replica of legendary magazine programme Ittadi which put forth a few of IPSC's problems through wit and sarcasm. Nawshad Asraf played the part of Hanif Sanket. It began with the song of “Nikosh kalo Adhare” by Krishanu. Then followed an entertaining talk-show with questions asked to the spectators. In addition, they made a combination of ethnic dance and pop dance which was loudly applauded by guests as well as students. Last but not the least, Itiadi presented an interview from a mad leader and concluded through the performance of a wild dance. “This is not only a cultural function but also a venue for meeting our college friends” said one of the former students of IPSC. In conclusion, the cultural function was truly brilliant and was enjoyed greatly by all the students and teachers of IPSC.